OTTAWA, April 10, 2018 — The trend in housing starts was 226,842 units in March 2018, compared to 225,804 units in February 2018, according to Canada Mortgage and Housing Corporation (CMHC). This trend measure is a six-month moving average of the monthly seasonally adjusted annual rates (SAAR) of housing starts. Rising March housing starts capped off a strong first quarter in starts in the Vancouver Census Metropolitan Area (CMA). Starts of multifamily condominium and rental units led the increase, with activity concentrated in the core areas of the City of Vancouver, Richmond, and North Vancouver in the first quarter of this year. Demand for new homes continues to be supported by strong migration, household formation and employment growth in the region. Housing starts in Metro Victoria appear to be moving in different directions with single-detached and apartment units diverging. Overall, the total starts are trending downward from a peak in late 2017. However, apartment starts were 77% above the March 2017 year-to-date figures, while single detached starts were down 32%. Inventory in single-detached units has shown signs of accumulation, but remains below average. Housing starts in the Edmonton CMA continued to trend lower in March due in part to a declining trend in multi-family construction where inventory levels remain elevated. Weakness in multi-family construction lowered actual total housing starts for the month of March, down 44% compared to March of last year. Led by condominium apartment starts, the total number of housing starts in the Toronto CMA trended up to reach a seven month high during March. Relatively affordable prices of condominium apartments continued to draw price weary buyers towards purchasing pre-construction units, particularly within the City of Toronto, and thus drove up their construction. High house prices and tighter borrowing conditions weighed on demand for single and semi-detached homes and consequently their starts trended lower. The St. Catharines-Niagara CMA saw 165 total actual starts in March, the highest recorded for the month since 1992. The trend towards relatively more affordable higher-density housing continued with multi-units accounting for 73% of total starts, up from 41% last March. Weaker employment conditions and rising housing prices continue to favour a mix toward more affordable housing driving multi-unit starts. Housing starts trended up in Brantford due to single-detached starts, which were already high in January and February. The strong March allowed single-detached starts to reach its highest first quarter total in over 10 years. A primary driver behind the increased demand for new single-detached homes in Brantford has been Greater Toronto and Hamilton area buyers seeking more affordable housing options. The level of housing starts for the total aggregate of Quebec’s urban centres remained stable in the first quarter, in both the single-detached home and multi-unit housing segments. Apartment starts decreased in all of the province’s census metropolitan areas (CMAs) except in the Québec CMA, where an increase was recorded in the first quarter. The increase for that segment in the Québec CMA offset the decreases in the other CMAs of the province. The single-detached market in Halifax continues to expand over the first quarter, up 42% compared to the same period last year. Despite the price differential, with the number of active listings on the resale market remaining low, buyers may be increasingly looking to the new home market to meet their purchasing needs. On the contrary, construction in the typically busy multiples market has slowed over the first quarter, down 37% year-over-year. 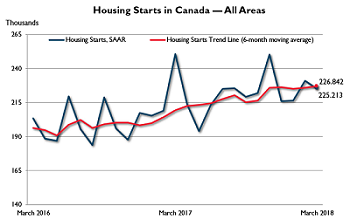 The standalone monthly SAAR of housing starts for all areas in Canada was 225,213 units in March, down from 231,026 units in February. The SAAR of urban starts decreased by 2.8% in March to 208,237 units. Multiple urban starts decreased by 7.3% to 144,578 units in March while single-detached urban starts increased by 9.5% to 63,659 units. Rural starts were estimated at a seasonally adjusted annual rate of 16,976 units.